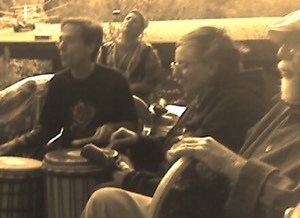 The volume of the drumming should be responsive to the circle. As soon as you hear singing or spoken word, bring it way down. If you are changing instruments or leaving the drum zone, fade your part out. Dropping a part suddenly can be jarring for other people. If you hear a chant starting, keep the beat going quietly and listen to whether it fits the chant. Copying (doubling) someone else's part can really strengthen the groove. It's good to play a simple part as accurately as you can. Two or three simple parts played well sounds much better than six people all madly soloing. If you hear a more complex part, pre-hear it and enter quietly. Sonic diversity is good, allowing for quieter instruments – frame drums, melodic instruments and solo vocal improv. Choose instruments that best fit the energy of the moment. Padded mallets are useful. Louder drums – dumbeks, djembes, djun-djuns and congas can be played quietly too! To help keep focus, stay in visual contact with the other drummers. Anyone can use signals to change the tempo or dynamic. First, get the attention of the other drummers. If you want to go faster say, "Sup." For slower say, "Sloooow". To go quieter (at the same tempo) motion one flat hand downwards. To fade out to silence say, "Sail away." Silences are essential. Four silent periods in an evening is a good starting place. Consider leaving at least a couple of minutes before playing again. Before the circle opens the texture is very spare, with one melodic instrument, low heartbeat drum, rattles, and light bells or bowls and no other instruments. After that anyone is free to create a texture that supports what's happening in the circle. Take drums out of the drum zone when you're not playing them, unless they are our resident djun-djuns set up on chairs. Uncovered drums near the circle are assumed to be OK for anyone to play, but make sure to remove any rings to avoid damaging hand drums. There is limited seating in the drum zone to encourage people to rotate in and out. Please leave the drum zone at least once during the event, to stretch your own boundaries as well as to make space for other musicians. We hope that you'll feel inspired to take the opportunity to participate in drumming at Spark. Whether you're a drum master or this is the first time you've picked up an instrument, your presence and contribution is welcome.